though he lost the popular vote by 3 million votes. We have seen how much this matters in the year since he has become President, which is especially true because the Republicans also won both houses of Congress, allowing President Trump to carry out his platform promises, creating major changes in tax policy, immigration, foreign policy, trade and making Supreme Court and lower court appointments. There is broad resistance to those Trump policies, but by executive orders and the momentum of the first year of his presidency, he continues often to get his way in changing the country’s direction. Trump’s victorious campaign strategy emphasizing charisma and addressing voters’ anger won out won over that of the less charismatic candidate Hillary Clinton following a careful game plan. Anger in both political parties – as reflected in the Democrats supporting Bernie Sanders and Trump Republican voters – reflected real needs and a high level of discontent. The recent Illinois primaries were the second national primary elections after those earlier in the month in Texas and they are a harbinger of things to come in November. The biggest battle in 2018 is the attempt of the Democrats to gain 24 seats in the House of Representatives and two seats in the Senate to retake control of one or both houses of Congress in order to block further Trump administration policies. Results from the Illinois election show higher voter turnout in a greater number of contested elections. Early voting and absentee voting was more than double the 2010 and 2014 midterm elections and the final vote tallies show that 2018 Illinois voter turnout exceeded 30%, as compared to the midterm general election of 2014 when only 16 percent turned out. While not as high a turnout as desirable, these figures show that voters perceived the choices to be important. As is usual in a midterm election, the party out of power was energized, with Democrats voting twice as heavily as Republicans. The Democratic races were mostly close and interesting. In the gubernatorial race, Pritzker won the Democratic vote easily while Rauner barely beat Jeanne Ives, his opponent in the Republican primary. If we divide the total amount spent by the campaign with his total number of votes, Rauner paid $215 for each vote, and Pritzker paid nearly as much. In the attorney general race, Kwame Raoul defeated former Governor Pat Quinn and six other candidates. In the Cook County assessor race incumbent Democrat Joe Berrios, an ally of controversial Party Chairman Mike Madigan, was defeated by Fritz Kaegi. Significantly, Jesus “Chuy” Garcia was elected to Congress and the progressive Latino candidates he supported defeated even incumbent State Legislator Daniel J. Burke, a relative of powerful Chicago alderman Ed Burke. There were other lessons in the 2016 and 2018 elections, specifically, the important roles both money and computer-generated data analytics will play in most future elections. In terms of campaign funding, every election seems to be more expensive than the last. 2016 was one the most expensive elections in American history, with at least $1.3 billion being spent by presidential candidates, $1 billion by candidates for the House of Representatives and $700 million on the U.S. Senate contests. In the most expensive race for Illinois State Legislature in 2016, the candidates spent from $106 to $113 for each of the 20,000 votes they each received. Nonetheless, any campaign begins with a budget and the contribution that the candidate and his or her family are willing to contribute so you know how much you need to raise, whether it is $10,000 or a million dollars. You could have the best candidate in the world the best campaign theme, and an inferior opponent, and still lose. You have to raise money to be taken seriously as a candidate. To run for alderman or state legislator you have to raise at least $250,000; Congressional races cost over a million dollars, and Statewide races for U.S. Senate or Governor cost tens of millions. Unless you are independently wealthy like Donald Trump, or the Illinois gubernatorial candidates Bruce Rauner or J. B. Pritzker, you have to raise money from contributors including wealthier individuals and groups like Labor Union or Business PACs. Beyond campaign fundraising parties and web site requests for donations, the primary secret to raising money is to have the candidate personally ask prospects herself. Several hours a day a staff member or volunteer literally places calls for the candidate to the prospect list who have usually received a letter of solicitation beforehand. Candidates simply hate to do fundraising calls, but even though it seems to them too much like begging, they still have to make the calls every day if they want to be elected. Once elected, our congressional representatives spend from 2-4 hours a day making fundraising calls for their next election. In addition to the one-on-one fundraising calls to individuals and PAC officials, money is raised by positioning a contribute button prominently on the campaign web site and by sending frequent emails or social media messages to all campaign supporters for smaller campaign contributions from $5 to $500. These small amounts add up; the average campaign contribution to the Bernie Sanders campaign was $27. The secret is that once someone has given online or in person, they can be solicited again and again. These online messages are frequently tested with smaller groups until the campaign determines the most effective “ask” to produce the best results when sent to the entire list of supporters. In 2018 in Illinois, we had the most expensive gubernatorial primary in American history with Democratic challenger Pritzker spending almost $70 million and Republican incumbent Rauner spending over $75 million; the next three candidates (two Democrats, one Republican) spent over $13 million total. This election alone affirms that we desperately need real public funding of campaigns or “Small D Democracy,” as advocates call it. The second element that 21st century campaigns now include (on top of the traditional campaign strategies) is the increased used of voter analytics with online campaigning. Some of you are Democrats and would never vote for a Republican and some of you are Republicans and would almost never vote for a Democrat. In old Chicago the Democratic precinct captains would know who would vote for their party’s slate of candidates, but now with computer analytic tools anyone with enough money and computer savvy can know. Take the example of Tea Party conservative David Brat, who ran for Congress in Virginia’s Republican 2014 primary election. With only $200,000 in his war chest, he beat then Republican House Majority Leader Eric Cantor, who spent over $5 million in his campaign. Brat simply got more of his people out to vote by using voter analytics to find the voters who could be persuaded to cast ballots against Cantor. Similarly, Winning Elections tells the story of how now-Illinois State Senator Will Guzzardi was able to use voter analytics in an Illinois state legislative race to defeat Chicago Democratic Party Boss Joe Berrios’ daughter, despite the best efforts of their allies to keep her in the state legislature. Voter analytics combines information about who voted in each election with personal information gleaned from credit card purchases and Internet browsing, then adds voter responses from campaign contacts. Thus, in a Chicago ward that may have less than 20,000 voters, analytics can find and rank potential supporters your campaign should contact, which in this case would be less than 10,000. The Obama Presidential campaigns used a scale from 1-100 and any voters who scored higher than 65 were “must contacts.” The usual system uses “+”, “—“, and zero symbols or a sample scale of 1-5. The use of analytics can make easier what is still our two most effective method of delivering the campaign message: door-to-door precinct work and phone canvassing. In both instances, voter analytics finds the potential supporters on which a campaign can focus, and can also provide information on how to best approach them. Social media campaigns start with a simple looking campaign website with the same colors photos and message as other campaign materials such as brochures and yard signs. Added to that are campaign email lists partly gathered from the web pages of donors, volunteers, and supporters, who are contacted weekly online to contribute, attend events and volunteer. After a campaign has its basic web page and email lists, it establishes social media pages, (at the very least, on Facebook page and Twitter) so that people can follow the campaign and retweet or repost critical messages. For instance, through social media, the Bernie Sanders campaign scheduled 74 phone banking events at homes in the Chicago area, at which volunteers called Iowa voters before the caucuses in February, 2016. In the end, the 2016 election was one in which the majority of American voted “no!” against the elites and the status quo. There had been more than 4.4 million home foreclosures since the Great Recession began in 2008. There have been no real salary increases for the working and middle class for nearly two decades. Unemployment, especially in ghetto areas and among young adults remains too high. Americans were mad as hell and by their vote they signaled that they weren’t going to take it anymore. The 2018 election with its turnout twice that of 2014, indicates that voters are still both engaged and divided. On a more positive note, the Texas and Illinois primaries show us that voter participation is up, as are the number of people running for office. How the new and old candidates, Trump supporters and “resisters” alike, reach and motivate these voters is spelled out in Winning Elections in the 21st Century. Election campaigns this year are playing by new rules. The 2016 presidential nominating conventions clearly demonstrated that many voters are profoundly angry with politics as usual. Republicans primary voters bypassed even Tea Party candidates to nominate Donald Trump. Bernie Sanders, a liberal independent, won both delegates and platform concessions from Hillary Clinton. The alienated in both parties show deep dissatisfaction with elected officials, whom they view as ineffective and nonresponsive. At the same time, campaigns have become increasingly expensive. Candidates spend too much of their time raising money. Often, they seek to please potential donors more than their constituents. The Citizen United and McCutcheon court cases have drastically affected 21st century campaigns. Not only have limits on spending by interest groups been eliminated, but SuperPAC donors remain secret and flood campaigns with “dark money. 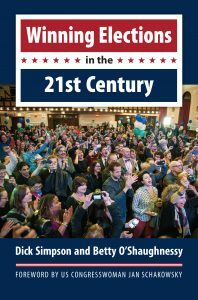 Our book, Winning Elections in the 21st Century, explains how grassroots campaigns can win despite these obstacles. It also decodes behind the scenes changes in the 2016 elections. A strong candidate with avid volunteers can still win votes with little money. The first thousand votes are cheap ‑ almost free ‑ because as much as five percent of the vote is obtained just by getting your candidate’s name on the ballot. The next few thousand votes require financing a headquarters, staff, and publicity. Toward the end of a close race, advertising extras like radio or television ads and direct mail must be bought. In today’s elections, however, there are additional costs in purchasing data analytic and technological expertise in managing social media, as well as purchasing Internet platforms and ads. Comparing today’s elections from those of the past, the Internet and related technology cannot be overlooked. The technology developed by national campaigns is now used in local campaigns to interact with their potential supporters to get volunteers, donations, and votes. Planning an online campaign begins by building an integrated system with traditional and online campaign components reinforcing each other. The major technological components of a twenty-first century participatory campaign include a campaign webpage, blogs, email lists, and social media such as Facebook and Twitter. Social media and bloggers have influence, so campaigns develop ways to monitor and respond to them. Knowing this, Donald Trump conducted his successful primary campaign mainly through use of often-hourly tweets. He sent more than 5,000 tweets in the first few months and had millions of views by the time of the early primaries. Data analytics, information on voters gathered through social media data, is also having a major effect on present-day campaigns. Even local campaigns now use cookie-targeted online advertising to reach voters. Campaigns market their candidate online just like any other product. Online politics brings both benefits and problems to voters and candidates. A candidate with no gravitas can use a catchy campaign to gain notoriety, displacing a worthy candidate with less online presence. This accounts for Donald Trump’s success in winning the Republican nomination for president in 2016. The Internet and social media have become a permanent part of modern political campaigns. Wise use of digital media gives an edge to a candidate, enabling anyone to interact with them. Smart campaigns use social media to reach voters inexpensively. As we recount in Winning Elections in the 21st Century, campaigns at even the most local level cost more than even the most expensive campaigns twenty years ago. Yet, raising money other than in Internet appeals is much the same. The candidate still has to meet and call donors for hours every single day. Today’s campaigns are digital, with websites, voter analytics, and social media. Digital technologies make it possible to select which voters to contact and how best to approach them; sending information cheaply to them through the Internet. But the simple principle behind this is the same since the days of Abraham Lincoln. Find your favorable voters, get them to the polls, and you win the election. Some of these new campaign trends boost voter information and participation. Some negative aspects threaten democracy. All these techniques, both the good and the bad, are now coming to local campaigns. Digital media is evolving quickly, so it is critical that it be harnessed to improve informed, democratic participation. This is a major challenge, not only for the Clinton and Trump campaigns, but for candidates running for town council, school board, or state legislature. No matter how crazy this election becomes under the new rules of the game, the end must be to improve, not undermine, our democracy.